The BBC Singers continue their critically lauded series of recordings with a new album of works by Master of the Queen’s Music Judith Weir. 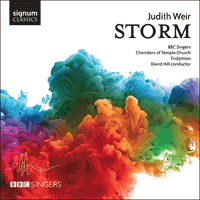 Recorded in the unique acoustic of the Temple Church, London, the BBC Singers are joined by the church’s choristers and the contemporary music ensemble Endymion, in a retrospective of Weir’s works drawn from a 25-year period. All the ends of the earth, for chorus, percussion and harp, was written for the BBC Singers as part of a Europe-wide radio broadcast on Millennium Day, 1 January 2000 celebrating the 1000-year old music of Perotin, on whose motet Viderunt omnes this composition is based. Perotin’s original, for four male voices, is based on a cantus firmus made up of pillar-like syllables which are widely spaced at first, but later succeed each other more rapidly until they become continuous. I retained these syllables (sung by tenors and basses, reinforced by tuned percussion and harp) placed in exactly the same bars as they appear in the Perotin. But I replaced Perotin’s upper voices with completely new, free-flowing music for sopranos and altos, who sing (in various solo and chorus combinations) a text known as the Alleluyatic Sequence, based on Psalm 148 (whose words I have also set elsewhere) which hymns the wonders of creation and the natural world. The texture, sparse at first, gradually builds into two richly polyphonic climaxes. Settings of the Magnificat and Nunc dimittis are a vital part of English choral music, but, having had very little personal experience of the Anglican liturgy for much of my life, it was in a spirit of exploration that I accepted an invitation from Andrew Nethsingha to write a ‘Mag and Nunc’ for St John’s College Choir, Cambridge. Imagining the music being sung during a church service, I saw it as a priority to set the extended Magnificat text compactly; writing in four parts (SATB) with no divisi proved the key to creating a fast-flowing texture in which the words were nevertheless clearly audible. Conversely in the brief Nunc dimittis the harmony has the time and space to build slowly into six-part sequences. The composition of Missa del Cid (for ten solo voices and narrator) allowed me to explore the intriguing relationship between warfare and religion. I compiled the text from the 13th century Cantar del Mio Cid which takes place during the reconquest of Spain from the Moors. The swashbuckling hero of this epic, Rodrigo Diaz de Vivar, seems to enjoy his battles, cheering himself on with frequent religious expressions; and so I imagined a Mass attended by him and his troops (of which there is a famous example in the original poem). The resulting Mass text, which enfolds a partial telling of the Cid’s story, is made up of extracts from Latin liturgy, and the Cantar itself, in its original Old Spanish, and contemporary English. Storm has its origins in a very sad event. In 1994, a local schoolteacher, Mrs Sylvia Collins, asked me to set Shakespeare’s Our revels now are ended (from The Tempest) in memory of her son Dr Stephen John Baldwin, who had recently died in an aircrash in Minnesota in winter 1993. She had found this text quoted in The Dhammapada, a Buddhist anthology amongst Stephen’s books. I set the words for upper voices and an orchestra of winds and timpani; this was first performed by students at Sylvia’s school, Haberdashers Askes’ Hatcham (in South London) in 1994. Entranced by the beauty and possibility of these words and musical forces, I started to write a suite of short Tempest settings for SSAA + treble chorus, and a 9-piece ensemble of flutes, cellos and percussion (out of which, Our Revels became the fourth movement of five) each attempting to distil one of the concepts of the play. The first performances of this larger work were given by the (then recently-formed) CBSO Junior and Senior Youth Choruses, conducted by Simon Halsey. Sylvia Collins herself died in 2014, and alas won’t be able to hear this premiere recording of the work she brought about and continued to support with her presence at many far-flung performances. I dedicate it to her memory, and that of her son Stephen.